The problem with “path surveys” today is that everyone who owns a hand held GPS, a $50 compass, an inexpensive pair of binoculars and an inexpensive subscription to Google earth considers him or herself a path surveyor. We are all too familiar with this ‘lowest bidder’ approach because a good percentage of our business is re-surveying paths done by these so-called experts. Excessive or insufficient centerlines, expensive tower replacements or height additions, waveguide costs and expensive antenna installations and on occasion a blocked path are just a few of the problems we have seen and are called upon to correct. There are no short cuts to success in reliable microwave path and system design. A systematic and detailed engineering approach is required to assure predictable results. By its nature, engineering is a discipline of science and precision, not guesswork and shortcuts. Reliable microwave path survey and system design involves much more than just establishing a visual line-of-sight path between the two antennas. The accuracy of path survey reports (which include site and path details), relies on the care taken to describe certain fundamental site and path parameters. The object of the site survey is to develop the geographical and physical framework for the network such that the established communications requirements can be met satisfactorily. The path survey, identifying potential problems, provides the basis upon which the microwave radio system parameters are established, performance calculations are made and analyses are conducted. 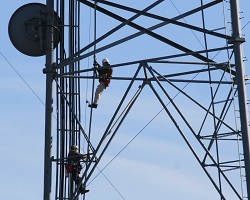 Utilizing verified data from the site and path survey, to address critical path clearances, reflection analysis, link analysis, and determination of required antenna heights above ground level, the final system design can proceed. The physics of each path, and the atmospheric refractivity conditions that can occur in the path’s environment, will dictate what the maximum reliable path distance will be. 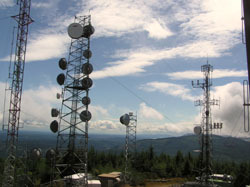 It is now possible for the designer of the microwave radio system to effectively address problems up front, so that an accurate bill of materials can be developed, proper antenna support structures ordered and put in place, and the predicted level of system performance can be achieved when the system is installed. A properly executed path survey is therefore well worth the expense. 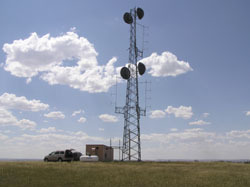 Measuring and surveying the terrain features between two tower sites to ensure adequate line-of-sight for terrestrial microwave transmission. Documenting distance and direction to existing airports for proposed tower site. Terrain data and in-path obstructions are carefully recorded to support a thorough path design calculations to determine antenna heights for each path. Determining the effect of the curvature of the earth on the path or K factor. Identification of reflection points and potential reflection zones are determined whether paths from antennas to reflective points are clear or obstructed. Adequate clearance for the invisible Fresnel zone, is determined, while not allowing the reflection point on the path to be visible to both antennas. If visibility of the reflection point cannot be avoided, then recommendations are made for new antenna heights that will place the point on a non-reflective surface along the path, position it on an odd-numbered Fresnel zone, and analyze where the reflection point may move within the range of possible refraction conditions that can occur. If new antenna heights are determined path clearances are checked under these same conditions, since an increase or decrease in the height of path obstructions will occur, depending on the K factor. 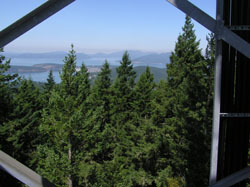 Profile chart for each link, showing trees, on- and off-path obstructions, water, Fresnel zones radii, reflection points.